Fixed Deposit (FD) is nothing new to us, literally everyone has invested some of their savings in Bank Fixed Deposit during some point of time. But at the same time, we love those investments that give us more returns than Fixed Deposits. It has already been talked about that, Debt based Mutual Funds are a better investment than Fixed Deposits. A lot of people are aware about it, but not many have actually made an investment in it. 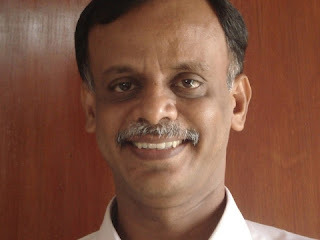 One of the reason could be, the returns from Mutual Funds is not fixed. There have been cases where the returns from mutual funds have been lesser than Fixed Deposits. Investors get a specified return interest for a fixed time. The interest is not going to fluctuate like it does in some Mutual Funds. Hence, investing in Non-Convertible Debentures means, you will get your specified interest at the opted intervals. There are different options for investors to get their returns. It could be once a month, or once a year, or during the end of its term. There are different options for Investment Time Period too, like 3 years, 5 years or 10 years. The investor can choose their preferred time periods. Fixed Deposits cannot be transferred from one person to another. However, Non-Convertible Debentures can be transferred from one person to another and hence can be sold and bought in the market. You can break a Fixed Deposit and take your money back with a reduced interest rate. However, in terms of Non-Convertible Debentures, the institution will not allow you to break before its maturity. As indicated in point 4, you can sell it in the market and receive the proceedings. 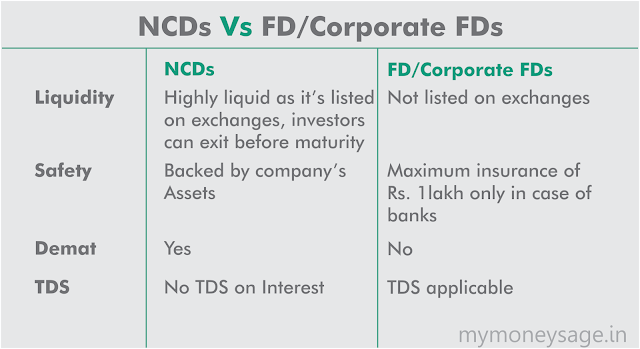 Most of the NCD’s are Secured NCD’s. In a situation where the institution is not able to return the investors’ money, there is a provision where trustees must sell underlying assets secured for the NCD and distribute the proceedings to the investors. This provision is not available in Fixed Deposits. Its one of the highlights of Non-Convertible Debentures. An important feature to keep a close eye out for is the Credit Ratings. If an NCD has a high rating (AAA), then its return percentage would be less. If an NCD has a low rating (A), then its interest rate is high. NCD’s are obtained in the form of DMAT. The interest rate outlook has changed from a rising trend to a stable or otherwise. The crude oil prices have gone down and the inflationary pressures are less, and in this scenario, the interest rates will not increase again. Because of this, the opportunity to invest in high interest rate instruments are less. Hence, we should use this opportunity to get 9+ % interest rate by investing in NCDs and it may turn out to be a good option. After ILFS episode, Non-banking finance companies are finding it difficult to meet their cash requirements to grow their business. In this backdrop, they are trying to woo the investor with higher interest NCD options. Investor can use this opportune time and invest in good company NCD with attractive interest rates. # The buying deadline day can be earlier than the date mentioned above. This is decided by the institution and once they receive the funds they estimated, they will decide. Hence, if you have decided to invest in NCD’s, then without any delay, invest quickly on them.